Oh, wouldn't you love to see truth in perfume names for just 24 hours? "Adorable Rebellious Middle Child" for L'Anarchiste, "Cuddlebunny" for Lauren's Rebellious, "Divine Hamster Cage" for Feminite du Bois, "Never-Found-In-Nature" for Cool Water, etc.. Wouldn't it be fun?? I know they smell absolutely nothing alike, but this one is the one that popped to mind when I was thinking of something in the $30 range online that steals the latest Malle,s Lunch money. I love this stuff, and I would be happy to wear it myself anytime. Marla, I like the way you think! Tom, I could think of many men's scents that this would eclipse. 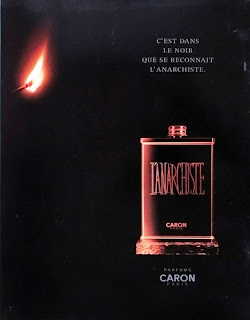 I've had the oddest experience with L'Anarchiste. I bought it blind for next to nothing a few months ago (I already had 3rd Man and Yatagan, both of which I love). And the first three or four times I wore it, I just didn't get it. Seemed pleasant enough if a bit loud. Warm weather came and I put it away, in large measure because it felt like a cooler weather scent to me. But then I kept reading people on BN talking about it as a warm weather frag, so I recently tried it on a really hot day. Much, much better. A very pleasant surprise, if still only my 3rd favorite among my thre Carons. Lovely to see your comment! I think this should be cooling in the heat too. Me too, I'd wear it with much pleasure. Interesting! I imagine it might possibly be a little on a too cool side in cold weather. Firstly, thanks to PhinClio for reminding me that I am in the mood to revert back to Yatagan yet again.